So in the past two days I have been thinking about something. Many new players tend to ask around which ship is the best one to buy or save up for. And often the answer is a little out of the reach of our little fellas. While they could buy ships like the Carrier X-32 or the Police Pursuit P1 as example, this choice of ship is rather mediocre and the flux could be spent better elsewhere. With that I had the idea to develop a ship that is "fixing" a bridge between the starter ships and the mid-level ships. It is a ship that is definitely stronger than the starter ships, but weaker than most of the mid-level ships. It is free to obtain during a mission chain. And the mission chain requires a bit of farming and killing of stronger enemies, so low level players have to work a bit for it while high level players would have no problem completing it. The mission chain can be initiated on the Arrenius Hangar and has a length of 15 parts. The recommended level is 20 - 30 as the enemies you have to face are strong enough to wipe out lower levels with no problem. The reward is XP, lots of steel and of course a new ship with a new weapon. Hangar worker: "Hey... Hey, you... Your ship sure is one of the cheaper ones, isn't it? Didn't thought you'd come this far with that piece of junk!" *He bursts out in laughter as he looks at your ship again, but quickly catches his breath again and looks at you. * "Ahem, sorry... No offense but your current ride is... outdated. It's almost painful to see you flying around with this." *He puts a finger on his chin and looks onto the ceiling. After 10 seconds he looks behind himself and smiles. * "Y'know, you might save the universe one day, so I make you a deal. Keep your flux into your pockets and save up for one of those better ships. I will build a better ride for you with my crew!" *He winks at you* "What you have to do? Gather materials, get a blueprint a few of those pirates stole, do some jobs. Whaddaya say, deal?" *As you nod in affirmation, he gives you another smirk* "Good. First we should take care of surrounding enemies. Take out a few of 'em, will ya?" Task: Kill 100 enemies in Arrenius. "Just by looking out of the window I can see that we have a clear sky now. Good job, I suppose you are finished?" Hangar Worker: "Good job at clearing the outsides, pal. Also, I forgot to introduce myself. Name's jack. I'm the prime worker on this place." *He chuckles softly and continues speaking* "Speaking of working, you need to do more! What I want you to do next is to gather the materials for the ship. I can remember that you need a lot of steel for that. SO please bring me 800 Metal scraps." Jack: "Are you finished yet? Just checking on 'ya. Ahh, you are done, good job. Please come back to the hangar!" Jack wanted us to return to the hangar as fast as possible. So we should do that and not lose the metal scraps in our storage. Jack: "Welcome back. Ahh, I see you brought the Metal Scraps, very good!" Jack: "I hate to tell you but this is the only thing I know. We need to get the blueprints back. Those pirates stole them not so long ago, so they might still be around in this system. We should get them!" *He pulls out a pad from his pocket. This pad seems to be a navigation system. On the left side of arrenius seems to be a sun. * "Well, would you look at this. This sun never had any structures nearby, now it does. Time to pay them a visit, shall we?" *He looks at you and scratches the back of his head. * "And with we I mean you." Jack: "And my navigation system tells me that those structures are gone. Good job! Come back to me and bring those blueprints!" We really should get back to the hangar quickly. We don't know if they have requested reinforcements. Jack: "Ahh, welcome back! And I see you brought the Blueprints. Well, time to take a look at what we need, shall we?" Jack: "According to these blueprints we need various materials. Some of them are already here, but we need a few more. Let's start with the simple one: The shield core." 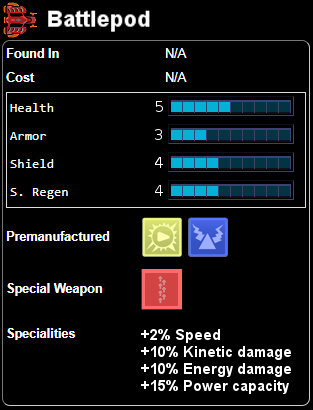 *He points with his finger on the shield core description. He takes out a small book and opens a page with an extended description of the shield core. * "Well, it looks like we need some Fusion Cores, some Alien alloys and a few big metal scraps. Bring them to me, alright?" Jack: "Well done. The next thing we need is the Engine. We require a few more resources for that one. Please make sure to grab them for me as well and I will give you the last required parts shortly after you collected them." Jack: "Well, now we need Alien alloys, Engine parts and Radiated junk. All of these components should be enough to create a good working engine. After you got those I will give you the last parts required for the power core." Jack: "You got the parts? very good. I'm impressed. Well, the last thing we need are the parts for an enhanced power core. Unfortunately those require a lot more parts than the previous ones. So I hope you have time." Jack: "Alright, the last part we need resources for is the enhanced power core. I have never seen this model before. Nonetheless, we require a lot of core charges, big metal scraps, Alien alloys and an advanced data chip. All of them at a decent amount. Well, good luck!" Jack: "I'm just going to check on you. Did you get all the parts? You did? Beautiful, return them to me so I can start working on the ship. My crew and I should have the ship build in no time." Jack wants us to return all of these parts to him. We better do that quickly, we really could need a better ship. Jack: "Good that you are back, our crew is already here and ready to build this ship. It's a newer model but it was never produced and it was quickly replaced by a few better ships that required less resources. So because of that this one is free for you. Well, crew. Let's get working! In the meantime you can entertain yourself." Jack: "Good news, your ship is ready to fly. However, it doesn't have a weapon. It can fly without but better having a defense, right?" Jack: "Return to me for now. I see this ship can wield a special type of blaster weapon. It looks like a heavy blaster. Now this is interesting. For now you can give it a test flight, I have preinstalled a Nova for you, it was laying around anyways so it could help killing a few enemies with it." Jack: "What do you say, do you like it? It isn't the best ship and I will still give you the advice to buy a better ship in the future. For now you have a good ride. However, this ship is not done yet." Jack: "I have good news and bad news for you. The good news I was able to upgrade the nova weapon to level 3, so killing enemies will be a bit easier. The bad news? The other weapon has a separate blueprint also stolen by the pirates." *He sighs out* "So we have to kill those pirates again and land on their station." Jack: "I can see you got the blueprint for the weapon. Return it to me so I can give you the last needed resources." Let's return this blueprint to Jack and get ready to collect more resources. Jack: "Good, good! Give me the blueprints... Let's see..."
Jack: "Alright. This is your final task. According to the blueprint we need a few more things now. We would need some Big metal scraps, a few core charges, a few fusion cores as well as a few alien alloys and a good amount of radiated junk. I think you can obtain all of those, right?" Jack: "Well look at this. You got all of the resources. Now get back to me and we can finally install that weapon. And with that your ship would be finished." Let's return to the hangar and finally obtain our deserved ship. Jack: "Good. Now let's assemble it." *A few minutes later* "Aaaaand done. Perfect, fits like it was just made for it... I mean, it was. Anyways, here is your ship. Good luck on your future adventure, and come back any time to get a new ship! "A self-crafted ship that will help a growing pilot on his future mission." Up to +100% Kinetic burn over 10 seconds. Up to 10% of damage done on health/shield is healed. Wow, this is excellent. I’d love to see this in game! The dialogue is really good too! It has a few grammatical issues, but those can easily be fixed. Assuming the devs make this ._. *Facepalm* - I read through it again and I completely forgot to mention the enemie's stats. Well, let me fix it now. Has a 0.5% chance to drop battle blaster. That should be all I think. Also, I'm glad you like it, traf. A very good mission that could be useful for future free players! If the DEVS EVER ADD THIS, of course. Wow you MUST tell me how you made that ship design!!! One awesome ship!! 2 Awesome wep and 3 just pure AWESOME!